CEEQUAL is governed by an overarching methodology that all assessment questions are based on. 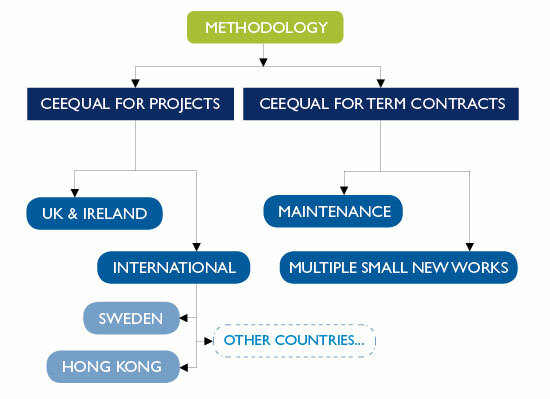 As seen below, the scheme is available in two forms: CEEQUAL for Projects and CEEQUAL for Term Contracts. Each form of the Scheme has a different fee-scale and is based on the contract value of the project or contracted works or, if applying early in the process, on the client’s or engineer’s estimate of that construction value. Learn more about CEEQUAL feescales. The current Version of the Methodology is Version 5, released for use on the Assessment of Projects in August 2012. Term Contracts Version 5 was released in February 2014. The text on the website concentrates on Version 5; however, it should be noted that more than 250 Assessments are still in progress using Version 4, which remains a valid assessment method for projects and contracts developed in the last 5 years. Details of the Version 4 Scheme are available in the Scheme Description for Version 4 available from the Downloads page. Applicable to all types of civil engineering, infrastructure, landscaping and public realm works (including the infrastructure associated with building developments) the Projects Assessment Manual is currently available International Edition, and a targeted UK & Ireland Edition with localised guidance. On large and complicated projects, it can be impractical to assess the scheme as just one single project. In such a case multi-package assessments can be applied for. Specifically created for the assessment of civil engineering and public realm works that are undertaken through contracts over a number of years and in a wide geographical or operational area, currently, the CEEQUAL for Term Contracts Assessment Manuals are only available for UK & Ireland-based contracts. Do you wonder about the benefits of using CEEQUAL? Learn more about the benefits of CEEQUAL. Not sure what form of the Scheme you should be using or what type of Award is best for you? Call us on +44 (0) 333 014 7880 or email enquiries@ceequal.com.